"Building a more resilient Nevada." -Take U.S. 95 North to Silver Springs. -Follow the signs to NV-439 North. -Take NV-439 North to I-80 West. -Take Exit 13 toward Downtown Reno/Virginia Street and E. 8th Street. -Turn left from E. 8th Street to N. Virginia Street. 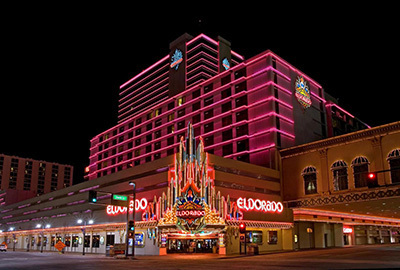 -The Eldorado Resort Casino will be on your right, just past W. 4th Street. -Take I-80 West to Reno. -Follow the signs to I-80 West. -Take I-15 South to Exit 91 for NV-168 West. -Follow NV-168 West to U.S. 93 North. -Take U.S. 93 North to NV-375 North. -Take U.S. 6 West at Warm Springs. -Take U.S. 95 North at Tonopah. -Follow U.S. 95 North to Silver Springs. -Follow NV-160 West to U.S. 95 North.